As a legitimate blogger who posts nearly weekly, I've made it a habit during my adult life to pick up a crisp, new Official Chicago Cubs Media Guide at the beginning of every year. No, I don't know why either. But now I find myself with a stack of these, and thus am able to throw myself down the rabbit hole of the Cubs careers that never were. Acquired: Traded from Montreal for Wilton Chavez, who has pitched for 14 different minor league teams, if you count the Mexican League. Random Write-Up: Born in Panama City, Panama, a hardscrabble metropolis notable mostly for its vicious dancefighting culture. Signed in 1992 by Montreal, which used to be a franchise that existed. Not many people saw them, though. Played in Montreal's minor league system from 1994 until 1997, when he was went to Detroit as a Rule 5 draft. Finally made the majors in 1999, where he was a lifetime .256 switch hitter with 26 home runs and 173 RBI. Came to the Cubs in 2004 and played two years as "that guy," then went to the Nippon-Hokkaido Ham Fighters, and the Diablo Rojos of the Mexican League a couple years after that. Notice anything? Bland. He's perhaps the blandest of the mid-2000s Cubs, which is saying something. He makes Daryle Ward look like Mark Grace in terms of charisma. If he were white, I'd call him Whitebread, but I'll stay away from baking terms, as Brownbread sounds pretty racist. Also of Note: He was at Wrigley on June 6, 2004, helping Greg Maddux win his 5th game of that year, back when we were a trendy World Series pick and LaTroy Hawkins was a name that people on the North Side hadn't yet begun to despise. It was also the first game at Wrigley where I enjoyed a wax paper cup of Old Style. I ... may or may not have been 20 years old at the time. It's where I got this media guide I inexplicably hang on to! You May Remember Him From: You won't remember Jose Macias. 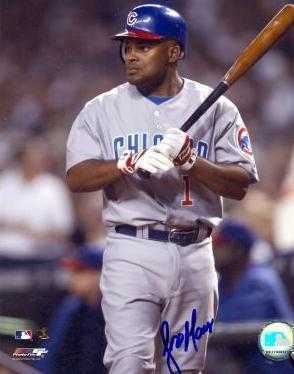 But you all remember the concept of Jose Macias in your Cubs fan hearts.